The heart pumps blood through the body with the help of structures such as ventricles, atria, and valves. The heart is divided into four chambers consisting of two atria and two ventricles; the atria receive blood, while the ventricles pump blood. The right atrium receives blood from the superior and inferior vena cavas and the coronary sinus; blood then moves to the right ventricle where it is pumped to the lungs. The lungs re-oxygenate the blood and send it to the left atrium. Blood moves from the left atrium to the left ventricle via the bicuspid valve; blood is pumped out of the left ventricle to the aorta, which sends blood to the organs and muscles of the body. The heart is composed of three layers: the epicardium (outer layer), the myocardium (middle layer), and the endocardium (inner layer). The heart is a complex muscle that pumps blood through the three divisions of the circulatory system: the coronary (vessels that serve the heart), pulmonary (heart and lungs), and systemic (systems of the body). Coronary circulation intrinsic to the heart takes blood directly from the main artery (aorta) coming from the heart. For pulmonary and systemic circulation, the heart has to pump blood to the lungs or the rest of the body, respectively. 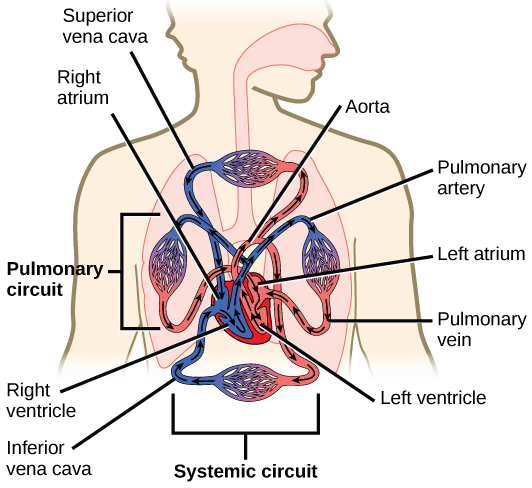 Circulatory System: The mammalian circulatory system is divided into three circuits: the systemic circuit, the pulmonary circuit, and the coronary circuit. Blood is pumped from veins of the systemic circuit into the right atrium of the heart, then into the right ventricle. Blood then enters the pulmonary circuit and is oxygenated by the lungs. From the pulmonary circuit, blood re-enters the heart through the left atrium. From the left ventricle, blood re-enters the systemic circuit through the aorta and is distributed to the rest of the body. The coronary circuit, which provides blood to the heart, is not shown. The heart muscle is asymmetrical as a result of the distance blood must travel in the pulmonary and systemic circuits. Since the right side of the heart sends blood to the pulmonary circuit, it is smaller than the left side, which must send blood out to the whole body in the systemic circuit. In humans, the heart is about the size of a clenched fist. It is divided into four chambers: two atria and two ventricles. There are one atrium and one ventricle on the right side and one atrium and one ventricle on the left side. The atria are the chambers that receive blood while the ventricles are the chambers that pump blood. The right atrium receives deoxygenated blood from the superior vena cava, which drains blood from the veins of the upper organs and arms. The right atrium also receives blood from the inferior vena cava, which drains blood from the veins of the lower organs and legs. In addition, the right atrium receives blood from the coronary sinus, which drains deoxygenated blood from the heart itself. This deoxygenated blood then passes to the right ventricle through the right atrioventricular valve (tricuspid valve), a flap of connective tissue that opens in only one direction to prevent the backflow of blood. After it is filled, the right ventricle pumps the blood through the pulmonary arteries to the lungs for re-oxygenation. After blood passes through the pulmonary arteries, the right semilunar valves close, preventing the blood from flowing backwards into the right ventricle. The left atrium then receives the oxygen-rich blood from the lungs via the pulmonary veins. 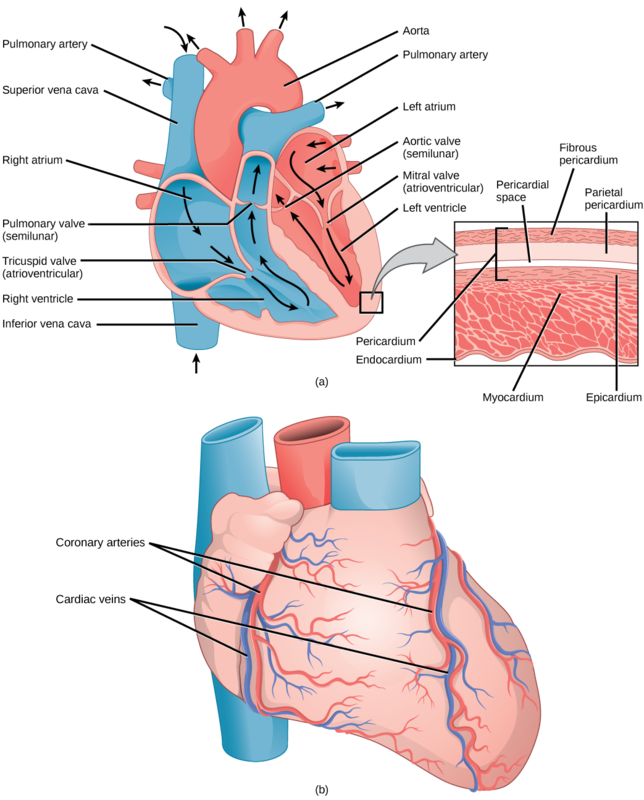 The valve separating the chambers on the left side of the heart is called the biscuspid or mitral valve (left atrioventricular valve).The blood passes through the bicuspid valve to the left ventricle where it is pumped out through the aorta, the major artery of the body, taking oxygenated blood to the organs and muscles of the body. Once blood is pumped out of the left ventricle and into the aorta, the aortic semilunar valve (or aortic valve) closes, preventing blood from flowing backward into the left ventricle. This pattern of pumping is referred to as double circulation and is found in all mammals. Human Heart: (a) The heart is primarily made of a thick muscle layer, called the myocardium, surrounded by membranes. One-way valves separate the four chambers. (b) Blood vessels of the coronary system, including the coronary arteries and veins, keep the heart muscles oxygenated. The heart is composed of three layers: the epicardium, the myocardium, and the endocardium. The inner wall of the heart is lined by the endocardium. The myocardium consists of the heart muscle cells that make up the middle layer and the bulk of the heart wall. The outer layer of cells is called the epicardium, the second layer of which is a membranous layered structure (the pericardium) that surrounds and protects the heart; it allows enough room for vigorous pumping, but also keeps the heart in place, reducing friction between the heart and other structures. The heart has its own blood vessels that supply the heart muscle with blood. The coronary arteries branch from the aorta, surrounding the outer surface of the heart like a crown. They diverge into capillaries where the heart muscle is supplied with oxygen before converging again into the coronary veins to take the deoxygenated blood back to the right atrium, where the blood will be re-oxygenated through the pulmonary circuit. Atherosclerosis is the blockage of an artery by the buildup of fatty plaques. The heart muscle will die without a steady supply of blood; because of the narrow size of the coronary arteries and their function in serving the heart itself, atherosclerosis can be deadly in these arteries. The slowing of blood flow and subsequent oxygen deprivation can cause severe pain, known as angina. Complete blockage of the arteries will cause myocardial infarction—death of cardiac muscle tissue—which is commonly known as a heart attack. Blood vessels include arteries, capillaries, and veins which are responsible for transporting blood throughout the body. Arteries carry blood away from the heart; the main artery is the aorta. Smaller arteries called arterioles diverge into capillary beds, which contain 10-100 capillaries that branch among the cells and tissues of the body. Capillaries carry blood away from the body and exchange nutrients, waste, and oxygen with tissues at the cellular level. Veins are blood vessels that bring blood back to the heart and drain blood from organs and limbs. Capillaries have one layer of cells (the endothelial tunic or tunica intima) where diffusion and exchange of materials takes place. Veins and arteries have two more tunics that surround the endothelium: the middle tunica media is composed of smooth muscle that regulates blood flow, while the outer tunica externa is connective tissue that supports blood vessels. The blood from the heart is carried through the body by a complex network of blood vessels. Arteries take blood away from the heart. The main artery is the aorta that branches into other major arteries, which take blood to different limbs and organs. These major arteries include the carotid artery, which takes blood to the brain; the brachial arteries, which take blood to the arms; and the thoracic artery, which takes blood to the thorax and then into the hepatic, renal, and gastric arteries for the liver, kidneys, and stomach, respectively. The iliac artery takes blood to the lower limbs. The major arteries diverge into minor arteries, and then into smaller vessels called arterioles, to reach more deeply into the muscles and organs of the body. Major arteries and veins: The blood from the heart is carried through the body by a complex network of blood vessels. 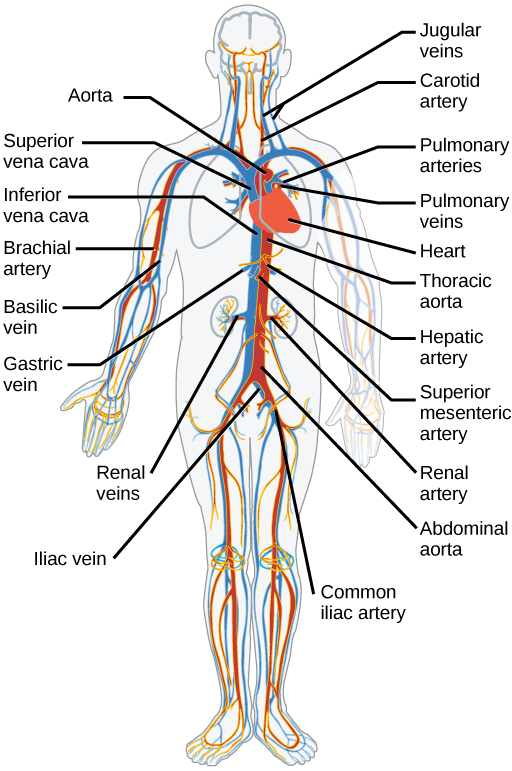 This diagram illustrates the major human arteries and veins of the human body. Arterioles diverge into capillary beds. Capillary beds contain a large number (10 to 100) of capillaries that branch among the cells and tissues of the body. Capillaries are narrow-diameter tubes that can fit red blood cells in single-file lines and are the sites for the exchange of nutrients, waste, and oxygen with tissues at the cellular level. Fluid also crosses into the interstitial space from the capillaries. The capillaries converge again into venules that connect to minor veins, which connect to major veins that take blood high in carbon dioxide back to the heart. The major veins drain blood from the same organs and limbs that the major arteries supply. Fluid is also brought back to the heart via the lymphatic system. The structure of the different types of blood vessels reflects their function or layers. There are three distinct layers, or tunics, that form the walls of blood vessels. The inner, tunica intima is a smooth, inner lining of endothelial cells that are in contact with the red blood cells. This tunic is continuous with the endocardium of the heart. Unlike veins and arteries, capillaries have only one tunic; this single layer of cells is the location of diffusion of oxygen and carbon dioxide between the endothelial cells and red blood cells, as well as the exchange site via endocytosis and exocytosis. The movement of materials at the site of capillaries is regulated by vasoconstriction, narrowing of the blood vessels, and vasodilation, widening of the blood vessels; this is important in the overall regulation of blood pressure. Blood vessel layers: Arteries and veins consist of three layers: an outer tunica externa, a middle tunica media, and an inner tunica intima. Capillaries consist of a single layer of epithelial cells, the endothelium tunic (tunica intima). 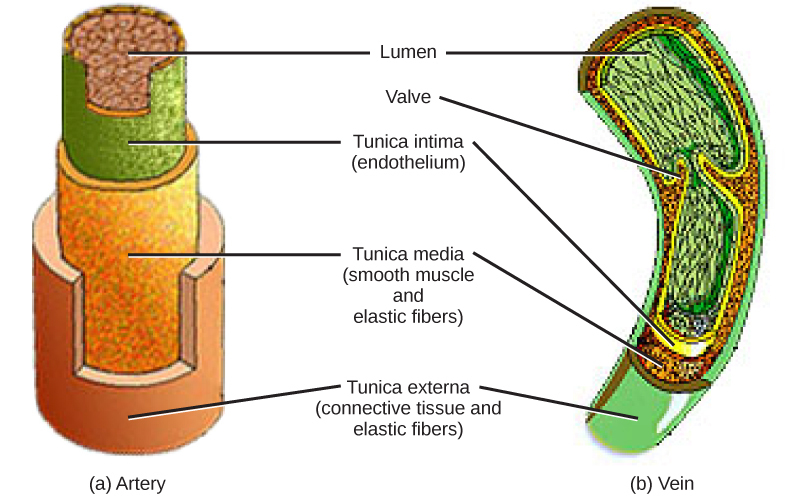 Veins and arteries both have two further tunics that surround the endothelium: the middle, tunica media is composed of smooth muscle, while the outer tunica externa is connective tissue (collagen and elastic fibers). The elastic, connective tissue stretches and supports the blood vessels, while the smooth muscle layer helps regulate blood flow by altering vascular resistance through vasoconstriction and vasodilation. The arteries have thicker smooth muscle and connective tissue than the veins to accommodate the higher pressure and speed of freshly-pumped blood. The veins are thinner walled as the pressure and rate of flow are much lower. In addition, veins are structurally different from arteries in that veins have valves to prevent the backflow of blood. Because veins have to work against gravity to get blood back to the heart, contraction of skeletal muscle assists with the flow of blood back to the heart. The cardiac cycle uses mechanical actions and electrical signals to push blood in and out of the heart. During the cardiac cycle, the heart contracts via systole, pushing blood out of the heart, and relaxes via diastole, filling the heart with blood. Cardiomyocytes, or cardiac cells, are striated and are responsible for the pumping of the heart; they are the only muscle cells with intercalated disks. The heart’s internal pacemaker regulates and times the beating of the heart via electrical signals. 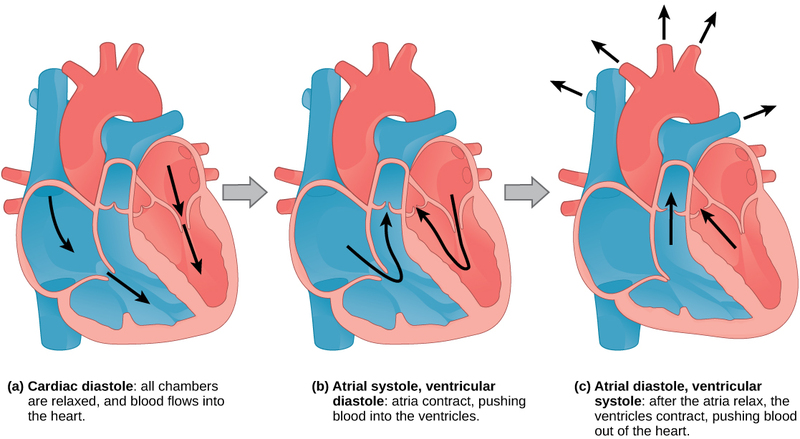 Electrical signals start at the SA node, causing atria contraction, and then move on to AV node, delaying electrical impulses to allow blood from the atrium to fill the ventricles. Signals move from the AV node to the bundle of His and then to the Prukinje fibers, which then allows the ventricles to contract. The main purpose of the heart is to pump blood through the body; it does so in a repeating sequence called the cardiac cycle. The cardiac cycle is the coordination of the filling and emptying of blood by electrical signals that cause the heart muscles to contract and relax. The human heart beats over 100,000 times per day. In each cardiac cycle, the heart contracts (systole), pushing out the blood and pumping it through the body. This is followed by a relaxation phase (diastole), where the heart fills with blood. The atria contract at the same time, forcing blood through the atrioventricular valves into the ventricles. Closing of the atrioventricular valves produces a monosyllabic “lup” sound. Following a brief delay, the ventricles contract at the same time forcing blood through the semilunar valves into the aorta and the pulmonary artery (which transports blood to the lungs). Closing of the semilunar valves produces a monosyllabic “dup” sound. Diastole and systole: (a) During cardiac diastole, the heart muscle is relaxed and blood flows into the heart. (b) During atrial systole, the atria contract, pushing blood into the ventricles. (c) During atrial diastole, the ventricles contract, forcing blood out of the heart. The pumping of the heart is a function of the cardiac muscle cells, or cardiomyocytes, that comprise the heart muscle. 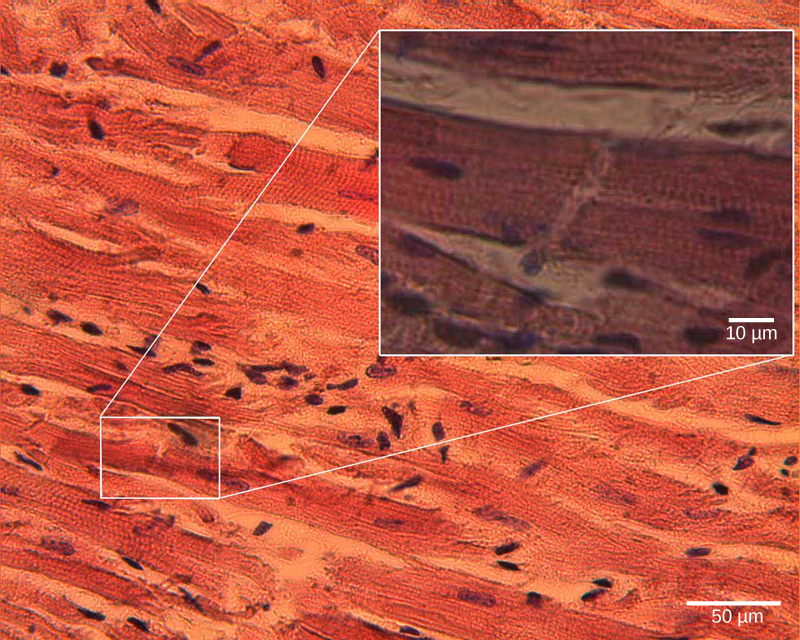 Cardiomyocytes are distinctive muscle cells that are striated like skeletal muscle, but pump rhythmically and involuntarily like smooth muscle; they are connected by intercalated disks exclusive to cardiac muscle. Cardiomyocytes are self-stimulated for a period of time; isolated cardiomyocytes will beat if given the correct balance of nutrients and electrolytes. Cardiomyocytes: Cardiomyocytes are striated muscle cells found in cardiac tissue. The autonomous beating of cardiac muscle cells is regulated by the heart’s internal pacemaker that uses electrical signals to time the beating of the heart. The electrical signals and mechanical actions are intimately intertwined. The internal pacemaker starts at the sinoatrial (SA) node, which is located near the wall of the right atrium. Electrical charges spontaneously pulse from the SA node, causing the two atria to contract in unison. The pulse reaches a second node, the atrioventricular (AV) node, between the right atrium and right ventricle, where it pauses for approximately 0.1 seconds before spreading to the walls of the ventricles. This pause allows the blood in the atria to empty completely into the ventricles before the ventricles pump out the blood. 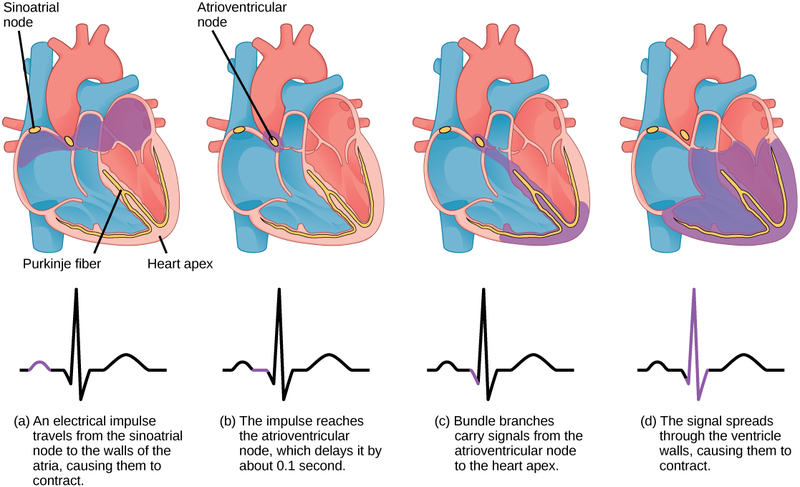 From the AV node, the electrical impulse enters the bundle of His, then to the left and right bundle branches extending through the interventricular septum. Finally, the Purkinje fibers conduct the impulse from the apex of the heart up the ventricular myocardium, causing the ventricles to contract. The electrical impulses in the heart produce electrical currents that flow through the body and can be measured on the skin using electrodes. This information can be observed as an electrocardiogram (ECG): a recording of the electrical impulses of the cardiac muscle. Electrical signals: The beating of the heart is regulated by an electrical impulse that causes the characteristic reading of an ECG. The signal is initiated at the sinoatrial valve. The signal then (a) spreads to the atria, causing them to contract. The signal is (b) delayed at the atrioventricular node before it is passed on to the (c) heart apex. The delay allows the atria to relax before the (d) ventricles contract. The final part of the ECG cycle prepares the heart for the next beat.